The Basilica of Guadalupe is a Catholic shrine on Tepeyac Hill in Mexico City that is devoted to Our Lady of Guadalupe. This is an important pilgrimage site and one of the most visited churches in the world. The original image of Our Lady of Guadalupe impressed on the cloak of Saint Juan Diego is on display within this basilica. Our Lady of Guadalupe is the patroness of Mexico, and many Mexicans are highly devoted to her. The Basilica of Guadalupe is a site of pilgrimage year round, but especially on December 12, the feast day of this manifestation of the Virgin Mary. Our Lady of Guadalupe (Nuestra Señora de Guadalupe in Spanish, also sometimes called Our Lady of Tepeyac or the Virgin of Guadalupe) is a manifestation of the Virgin Mary who first appeared on Tepeyac Hill outside Mexico City to a native Mexican peasant named Juan Diego Cuauhtlatoatzin in 1531. She asked him to speak to the bishop and tell him that she wished for a temple to be built in that place in her honor. He did so, but the bishop required a sign as proof. Juan Diego returned to the Virgin and she told him to pick some roses and carry them in his tilma (cloak) and take them to the bishop. When he went back to the bishop, he opened his cloak and the flowers fell out and all were astounded to see that there was an image of the Virgin miraculously imprinted on the garment. A simple shrine was built on the location in 1532, and it soon became a pilgrimage site. A new shrine was erected in 1622, and a more elaborate one in 1709, which was designated a basilica in 1904. That church became inadequate for the number of people who visited the shrine, and the current basilica was built in the 1970s. Juan Diego's tilma with the image of Our Lady of Guadalupe is displayed at the Basilica of Guadalupe. It is located over a moving walkway behind the altar, which keeps crowds moving so everyone gets a chance to see it up close (though it tends to complicate photo-taking). Over twenty million faithful visit the Basilica every year, making it the second most visited church in the world, after Saint Peter's Basilica in Vatican City. Juan Diego was canonized in 2002, making him the first indigenous American saint. Built between 1974 and 1976, the new basilica was designed by Pedro Ramirez Vasquez (who also designed the National Museum of Anthropology), constructed on the site of a 16th Century church, the "old basilica." The immense plaza in front of the basilica has room for 50 000 worshipers. At least that many faithful gather there on December 12th, the feast day of the Virgin of Guadalupe (Día de la Virgen de Guadalupe). The style of construction was inspired by 17th Century churches in Mexico. When the basilica was completed, some folks made disparaging remarks about its design (likening it to a circus tent). Defenders point out that the soft subsoil on which it is built required this type of construction, which is fairly lightweight. You can visit the "Old Basilica," built between 1695 and 1709, which is located to the side of the main basilica. Behind the old basilica there is a museum of religious art, and near there you will also find steps leading to the Capilla del Cerrito, the "hill chapel," which was built on the spot where the Virgin is believed to have appeared to Juan Diego, at the top of the hill. The Basilica is open daily from 6 am to 9 pm. The museum is open from 10 am to 6 pm Tuesday to Sunday and closed on Mondays. Visit the website of the Basilica de Guadalupe for more information. The Basilica de Guadalupe is located in the north part of Mexico City in an area called Villa de Guadalupe Hidalgo or simply "la Villa." Many local tour companies offer day trips to the Basilica of Guadalupe combined with a visit to Teotihuacan archaeological site, which is located farther north of Mexico City, but you can also get there on your own with public transportation. By bus: On Paseo de la Reforma take a " pesero" (bus) running north-east that says M La Villa. 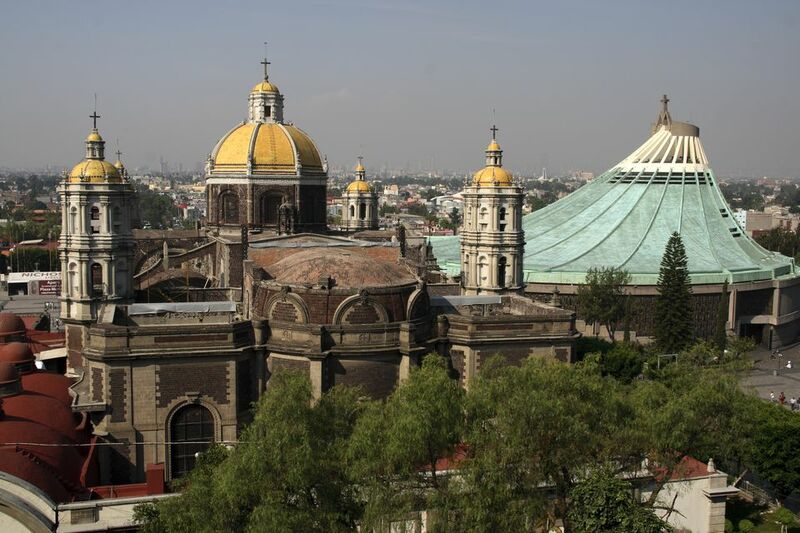 The Basilica of Guadalupe is on our list of Top 10 Mexico City Sights.